The Sentinel has reported that some local teenagers have exploited Montgomery County Speed Cameras for a new prank dubbed the Speed Camera "Pimping" game. The students duplicate the license plates by printing license plate numbers on glossy photo paper, using fonts that "mimic" those on Maryland license plates. They tape the duplicate plate over the existing plate on the back of their car, purposefully speed past a camera, and then quickly stop and remove the fake plate before they are detected. This easily thwarts the cursory review (if any) which tickets are given. The victim, who is identified solely by license plate numbers, receives a citation in the mail days later. The students used fonts which looked similar to those on a Maryland license plate available on the internet. In some cases, students have even obtained vehicles from their friends that are similar or identical to the make and model of the car owned by the targeted victim. Potentially a victim might not even realize it was not their car if they normally drive past the same camera. One parent who discovered this commented that "This game is very disturbing, especially since unsuspecting parents will also be victimized through receipt of unwarranted photo speed tickets." and stated that "I hope the public at large will complain loudly enough that local Montgomery County government officials will change their policy of using these cameras for monetary gain," the parent said. "The practice of sending speeding tickets to faceless recipients without any type of verification is unwarranted and an exploitation of our rights." Montgomery County Council President Phil Andrews was concerned that this could hurt the integrity of the Speed Camera Program. 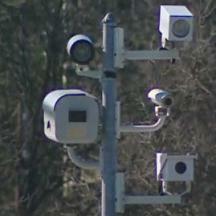 "It will cause potential problems for the Speed Camera Program in terms of the confidence in it." A paper duplicate would most likely be detected by a law enforcement officer close up, but probably not by one reviewing a large number of photographs one after another. Driving with a counterfeit or stolen license plate is illegal, and anyone engaging in such a "prank" should be aware that they could face criminal charges if they are spotted by a live police officer who, unlike a speed camera, is capable of independent thought.